Without a DNA or fingerprint connection apparently linking Riverside and the Zodiac Killer, many have tried to link the two through his correspondence. Was the Zodiac Killer responsible for the murder of Cheri Jo Bates in Riverside on October 30th 1966, and if so, was he a well-read individual with connections to the campus library. ​Forty-six consecutive letters from this text corresponds with a section of the 408 cipher. 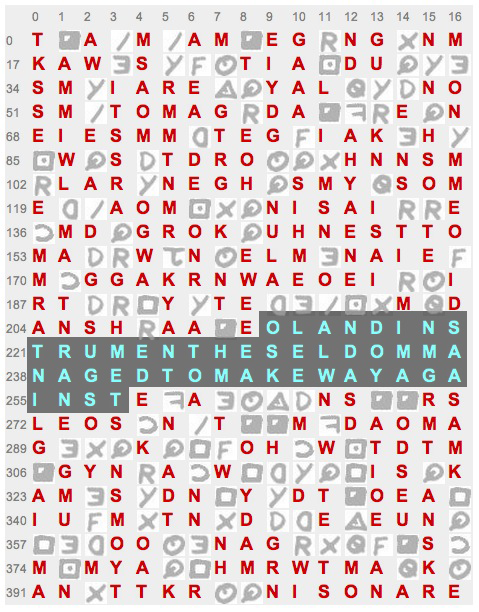 Dave Oranchak, the foremost expert on the Zodiac ciphers, commented on this "So, only one piece of text, from a vast collection of eleven billion pieces of text, fit into this chunk of cipher text. A one in eleven billion chance seems to suggest some significance. But don’t be fooled by this. Just because this rare event occurred, doesn’t mean it is anything more than a simple coincidence. If we didn’t already know the real solution to the 408, how do we know that this chunk of old and obscure text isn’t the correct solution?" I wanted to validate or refute whether this was a simple coincidence or not by examining whether the works of Edward, Earl of Clarendon featured anywhere else in Zodiac or Riverside correspondence. One wouldn't envisage many American criminals using the writings of a seventeenth century English statesman to form part of their serial murder exploits, and certainly not without access to a comprehensive library of books. This is when I noticed another piece of obscure text from Edward, Earl of Clarendon and flew back to the last piece of notable text from the presumed Zodiac Killer on the Riverside desktop- the title of which was "sick of living/unwilling to die." Had he plagiarized "weary of life, unwilling to die" to "sick of living, unwilling to die," and would then later hide another section of Edward Hyde's text in the 408 cipher, as a form of link between the murder in Riverside and the Bay Area. "Naturally a substantial portion of Clarendon's surviving manuscripts comprises his personal correspondence — both letters received by him from numerous correspondents and his own letters, written or signed by him, whether drafts, retained copies, or the letters actually sent. Among many notable examples are his letters written in August 1646 to William, Lord Widdrington, and to Sir John Berkeley, announcing the beginnings of his History of the Rebellion, and the letter he wrote on 12 November 1646, to Sir Edward Nicholas, describing his plan for the work and stating that he had already completed sixty sheets of it. Some of his letters, particularly those dating from the Civil War period, are wholly or partly in cipher or make use of pseudonyms in both salutations and signatures. The codes to sixteen such ciphers used by the Royalists are written out in Bodleian, MS Clarendon 94, and see also British Library,"
However, are there any alternatives to Edward Hyde- someone that possibly connects the 'Confession' letter and Riverside 'Desktop Poem' together, using the title of each communication. I have always believed the Zodiac Killer was driven by some form of warped religion- one that drove him to the confession box after each crime and manifested in the form of letters mailed to the newspapers and police. Using the Riverside library as our primary focus once again, did the works of an early Christian theologian and philosopher influence the writings of Zodiac. The Augustine he is referring to is St Augustine of Hippo (13 November 354 - 28 August 430), a Roman African, Christian theologian, whose writings influenced the development of Western Christianity and Western Philosophy. 2] "I do not know whether I would have been willing to die for him in the way that Orestes and Pylades, if the story is true, were willing to die together for each other. And yet a strange feeling had grown in me, and it was very different from theirs; I was sick and tired of living but I was too afraid to die." link. ​3] "But in me there was an odd kind of feeling, the exact opposite of theirs, for I was at once utterly weary of life and in great fear of death." link. Was this a case of the Zodiac Killer recalling the literary work of another, as he did with the Gilbert and Sullivan Mikado, but paraphrasing it. However, in this instance, the author chose sick of living/unwilling to die as his title of the 'Desktop Poem'. Two weeks after the October 30th 1966 murder of Cheri Jo Bates, the Riverside Police staged a library reconstruction of the crime on November 13th 1966. The probable murderer then mailed the 'Confession' letters. St Augustine of Hippo wrote the Confessions (in which the above examples of text are contained), an autobiographical piece of work consisting of 13 books. "The Confessions of Saint Augustine in order to distinguish the book from other books with similar titles. Its original title was Confessions in Thirteen Books, and it was composed to be read out loud with each book being a complete unit. Confessions is generally considered one of Augustine's most important texts. It is widely seen as the first Western autobiography ever written, and was an influential model for Christian writers throughout the Middle Ages. Professor Henry Chadwick wrote that Confessions will "always rank among the great masterpieces of western literature." link. St Augustine of Hippo was born on November 13th, the exact date of the library reconstruction. "The City of God Against the Pagans (Latin: De civitate Dei contra paganos), often called The City of God, is a book of Christian philosophy written in Latin by Augustine of Hippo in the early 5th century AD. The book was in response to allegations that Christianity brought about the decline of Rome and is considered one of Augustine's most important works, standing alongside The Confessions, The Enchiridion, On Christian Doctrine and On the Trinity. As a work of one of the most influential Church Fathers, The City of God is a cornerstone of Western thought, expounding on many profound questions of theology, such as the suffering of the righteous, the existence of evil, the conflict between free will and divine omniscience, and the doctrine of original sin." "Shortly before Augustine's death, the Vandals, a Germanic tribe that had converted to Arianism, invaded Roman Africa. The Vandals besieged Hippo in the spring of 430, when Augustine entered his final illness. According to Possidius, one of the few miracles attributed to Augustine, the healing of an ill man, took place during the siege. According to Possidius, Augustine spent his final days in prayer and repentance, requesting that the penitential Psalms of David be hung on his walls so that he could read them. He directed that the library of the church in Hippo and all the books therein should be carefully preserved. He died on 28 August 430. Shortly after his death, the Vandals lifted the siege of Hippo, but they returned not long thereafter and burned the city. They destroyed all of it but Augustine's cathedral and library, which they left untouched." Wikipedia. ​Was the murderer of Cheri Jo Bates somehow connected to the Riverside library, a well-read individual, who subtly introduced sections of text from St Augustine of Hippo into the titles of both the 'Riverside Desktop Poem' and 'The Confession' letter in order to give himself a feeling of superiority over the police and newspapers, as he would ultimately do several years later. Interesting reading. I really enjoy reading these articles, this site for me is the best one about the Zodiac case,just for the interesting write ups and theories. Keep up the good work Richard. Wonderful piece. There's a Greek connection here if one follows the reference to Orestes: "As an adult, Orestes returns to Mycenae/Argos to avenge the murder of Agamemnon. With the assistance of his friend Pylades, Orestes kills his mother Clytemnestra and her lover Aegisthus. While Pylades seems to be a very minor character, he is arguably the most vital piece of Orestes' plan to avenge his father. In The Libation Bearers, the second play of Aeschylus' trilogy The Oresteia, Pylades speaks only once. His lines come at the moment Orestes begins to falter and second-guess his decision to kill his mother. It is Pylades who convinces Orestes to follow through with his plan for revenge and carry out the murder. The significance of Pylades' lines has invited speculation into whether or not he might represent something more than human next to Orestes; he might play the role of divine encouragement or fate. Wiki. Thinking of my suspect 'Joe the Greek' and his employee Kane. Were they involved with the Library reconstruction? The first sign in the zodiac is the ram. Cheri Jo Bates graduated from Ramona High. Was she the zodiac's first sacrifice? Ramona High School is the home of the Rams. Well the Zodiac did write that she "went like a lamb to the slaughter", or words to that effect. The Zodiac’s motivation was fueled by religion and astrology. I’m thinking more on the Pieces Constilation and Dante’s Inferno. I need more info - are you referring to an association with what Dante himself wrote in a letter to Cangrande I della Scala, the (heroes journey) progression of the pilgrimage from Hell to Paradise is the paradigmatic expression of comedy, since the work begins with the pilgrim's moral confusion and ends with the vision of God. From Wikipedia - Are you saying the zodiac was hero in his own mind? "motivation" or something else? Using it as an excuse in order to taunt perhaps? Kind of a poor taste joke as a justification? I guess we will never know for sure if he was crazy enough to believe all this quasi-religious stuff, or just plain crazy, or smart enough to know exactly why he was replicating this stuff. madness or genius what is the difference? that is an age old debate. You're right, it is a "What came first, the chicken or the egg?" argument. What I was implying is, how can we know these things were such an important part of the Zodiac's life that he felt motivated by them? Not so much a question of "madness vs genius? ", more a question of "motivation versus conscious or subconscious replication?". Seems to have been a disproportionate number of religious zealots throughout history who were all too sick of living but unwilling to die. Martin Luther was just one of them. Taken to its extreme, it becomes a mortal sin to be unwilling to die if God wills it. How anyone knows if God has willed a death is beyond me. Sounds like good fodder for a deranged serial killer if you ask me! To be or not to be. Wow, sick of living, unwilling to die. That's pretty heavy, actually. We are not dealing with an unfeeling moron here, are we? The National Center for the Analysis of Violent Crime (NCAVC) is a component of the FBI’s Critical Incident Response Group (CIRG), located at the FBI Academy in Quantico, Virginia. The primary mission of the NCAVC is to provide behaviorally-based, operational support to federal, state, local, and international law enforcement agencies involved in the investigation of unusual or repetitive violent crimes, communicated threats, terrorism, and other matters of interest to law enforcement. ...serial killers suffer from a variety of personality disorders, including psychopathy, anti-social personality, and others. Most, however, are not adjudicated as insane under the law. There is a ton of info relating to serial killers at this site. I really think he must have had an extensive familiarity with an organized religion . I also seem to think Metaphysics (philosophy) was instrumental. He refers to “thing” and “things” often... im just guessing. BTK said he was in love with Annette Funicello in the 50's. And, though he lived in Kansas he planned on going to a Calif. beach and kill a couple (he was jealous of her in his madness she was cheating on him with Frankie Avalon). Denis Rader's name is dead center in the main code puzzle. He was a very religious guy. All of the circumstances for him being the Zodiac line up to near perfection. Going on circumstantial evidence alone Rader should be number 1 on the Zodiologist suspect list. He had many stop-overs at Calif. Air Force Bases when traveling to and from Japan when he was in the Air force. The CIA and the Air Force were found on the same day. The two are forever linked. The CIA Manchurian Candidates were programed to kill on D-day. All of the kills took place on that day. Was BTK programmed by MKSEARCH the modern term for MKULTRA (the CIA brain washing program to turn PTSD military men into robot assassins). The 6-6-44 anniversary of Sir han Sir han killing RFK just came and went without mention by the CIA controlled media. They keep spitting out propaganda and disinformation to keep us guessing while they continue to do their thing. "He had many stop-overs at Calif. Air Force Bases when traveling to and from Japan when he was in the Air force." Your proof for this is? Fact is you have no proof. Even the author of the book about Rader being the Zodiac fails to deliver on this smoking gun proof. Instead she suggests other people should look through Government archives to see if they can find it. As for the rest of what you say about BTK being programmed by the CIA, well that is just meaningless conspiracy gossip. Serial killers do not need to be programmed. The vast majority are lone operators who get off on their killing. Why do you find this so hard to believe? Serial killers have been around since the beginning of civilization and probably long before. There is ample evidence of serial killers existing in remote tribes for instance, far from the reaches of CIA or Illuminati or any other nefarious forces. There was a serial killer not far from where I live who was overdosing elderly patients at a nursing home. Nobody knows the true tally of her victims. Was she under the spell of CIA mind control. Somehow I doubt that very much. Why do you find this so hard to believe? Beliefs are for the superstitious. If you are a believer it is you who be knee deep in conspiracy. It be a Rayligous conspiracy. Worshiping at the alter of your own Rayligon. Superstition and belief are for the inculcated, and the naive to deal with their fear of the unknown. I served for sometime on a Air Force base when I was in the Corps. Flights always stop over in Calif.. Why do you find that so hard to believe? Resorting to semantics won't work. What's with all the "Ray" words? In fact what are you Ray-ving about? Or like Sandy do you believe I am Mike? No wonder so very few people ever reply to your comments. Best just ignored, like most comments from "off the planet" conspiracy theorists that keep going off topic like Captain Jack Sparrow on "Stranger Tides". Don't be insulting? Please! Practice what you preach. Karen, my good friend, you should know that Sandy thinks EVERY single comment that is "negative" (actually analytical) must have been made by Ray Jenkins, who she also thinks is Mike Butterfield. Ray tells me he feels very flattered to be likened to the brilliant Mike Butterfield. But now it seems you are also the omniscient bad guy known as "Ray"! So does that make you Mike Butterfield too? Oh no-o-o-o-o, I sense a conspiracy afoot!!! Ray is very amused and tells me he is enjoying the notoriety, without actually having to post anything. For Sandy, everything bad or goofy in her life equals Zodiac, and every bad online comment equals "Ray" (aka Mike Butterfield), possibly in league with Zodiac. Honcho, or whoever is stalking her lately. LOL! For BB everything bad that happens in the world equals CIA conspiracy, and every bad comment equals "Karen", AKA "Ray", AKA Mike Butterfield??? AKA possibly CIA?????? On Stranger Tides indeed. Great analogy. They could not get much stranger than this. This is actually a funny spat! Conspiracy theorists do not need proof. They merely throw a bunch of superfluous, circumstantial, and/or coincidental stuff together and BELIEVE that is proof enough of a conspiracy. Yet evidently, to most conspiracy theorists, real proof is not something you can believe in because "belief is a superstition". I agree with Karen, serial killers are coveting and controlling not controlled. With the Zodiac case he’s all about himself, super ego. I also believe he suffered from a serious what’s real and what’s not , fantasy versus truth. I also enjoyed a comment I read on this site that the letters to the papers were sort of a “confession “ ... did the Zodiac have a conscience? I doubt there was any regret, just a whole lot of justifying. Corey, I think you have hit the target dead center with your very succinct comment. Serial killers are a different, sometimes unique kind of insane. Still, they suffer the same obsessiveness and delusions of grandeur and paranoia as those who suffer from other well documented psychiatric conditions. They tend to replicate the same ideas over and over, both in their minds and on paper, beyond the point of obsession. And as with other psychiatric conditions, the deranged person can be very manipulative and controlling in their efforts to disguise their insanity. In the case of sociopaths, they may even seem intelligent and perfectly sane, perhaps even amicable, to those who meet them. Moreover, they will constantly seek a more normal justification for their problems, and for what they see as the problems surrounding them. We see this kind of "projecting" in the Zodiac correspondence all the time. Coveting, yes, Controlling, yes. Manipulating of the facts, yes. Egotism, yes. Delusions, yes. Fantasy, yes. Confessing, yes, but only in so far as the confession bolsters his ego. Lack of any real regret, yes. Disingenuous attempts to justify the reasons for killing people, yes, always. The Zodiac was all over the place with his justifications. He sometimes seems deadly serious about them, other times there is a distinct sense of fantasy, other times a sense that he is lying through his teeth and just trying to be funny. Humor is always used to conceal and to manipulate, and to bolster his ego by making him seem smart. What we read from him are really just the rantings of a very sick and twisted and tormented soul. As you say, he never shows any real regrets because he always provides numerous quasi-religious justifications. He wants us to believe his own deluded fantasies and outright lies. The one, simple truth is that he gets his rocks off on killing people. The thing with the Zodiac is that he often admits openly to this fact, before launching into his other peculiar justifications. But once again, this is really not so unusual for serial killers. Look at BTK, look at Manson, look at the Yorkshire Ripper, look at the Beauty Queen killer, etc. etc. etc. We see this time and time again. The Zodiac is really not "special" in that regard. In fact, in a lot of ways, he is a classic, textbook serial killer. This is despite all attempts by some people to paint him as something so unique that he was like the prized specimen who flew the coop from some top secret CIA experimental zoo. lol! I agree with Karen, serial killers are coveting and controlling not controlled. With the Zodiac case he’s all about himself, super ego. I also believe he suffered from a serious what’s real and what’s not , fantasy versus truth. I also enjoyed a comment I read on this site that the letters to the papers were sort of a “confession “ ... did the Zodiac have a conscience? He certainly had no regrets just a whole lot of justifying . Corey - please don't drink the kool-aid. Rayligon is a cult. They BS you - portraying themselves as Hunter S. Thompson rebels. But, in actuality they are all clones of the arch-authoritarian malignant narcissist that they worship. Hiding under the umbrella of critique for the good of tradition as a place of security. They have beliefs. Science knows this as superstition. They are threatened by anything that penetrates that bubble. They live by the cliché and the pun. They group together in the safety of number - blindly following a fallacious personality of cult. Rather than picking up a book and giving it fair consideration. They do not want to clutter their shelf. So they settle for the narrative laid-out for them by the MOCKINGBIRD controlled television media. This is silence of the lambs nonsense ---You should read the FBI site stuff on SKs --- There is no type---serial killers are controlled. And they are out of control--- they are all over the map. They are very sociable and very often likable. They have - like Raylord most high, many persona. Don't let his fear hold you to the safe place of the boring. That is the bland box he wants to keep you in. Think for yourself. Unlike the movie metamorphose of the moth - Raylord has chose to fly into the light of the proverbial flame. His brilliance blinds his cult following. Because Raylord is so fearful he lashes out in the forum of his own making. His fear propels him to create persona to hide behind and to express his many different fears.He is his own victim and his own god. Dialog within his head never ends as the circular logic keeps his mental wheels spinning. He does not respect free thinkers - he calls them folk names. Then when you dare to stand up to him - like any bully he gets offended. Fearing he will be usurped. And instead of just admitting he may be wrong. And like a stand up man say - touché. No - he uses the play book of a child - he makes fun of you saying Oh! How Touchy! Don't be fooled though he is just your average little bully. And, like all bullies and cult leaders - Raylord just wants everyone to love him. Every now and then a train derails itself and plummets headlong through the woods out of control. A few deer come under the spell of its headlights. Other more intelligent critters flee at the sound of the impending chaos. They sense the danger of the chaotic thing that is crashing blindly through the woods, well off its tracks. They give the derailed train a wide birth, lest they be sucked into the heavy machinations and taken along for a long and chaotic ride heading nowhere into oblivion. You are amazing, the Zodiac is a philosopher. With a hint of psychology. The math and physics were supplements. Certainly building blocks to the eventual product. I call it a cocktail. I must say that I did in fact agree in part with BB's first comment on the letters RAD being significant. They are placed so centrally in the cipher. They almost appear like an "in your face" statement, but at the same time one that has been obscured. John Rose's partial solution links some central ideas together that would otherwise have seemed unrelated in time. Moreover it links ideas that would otherwise have seemed unrelated in space. So here we have this big RAD in mid center, highlighted because of sound reasoning mixed with intelligent extrapolation. If the Zodiac had intended this connection, there is the obvious question, "Why would he feel so inclined?" Not only does RAD suggest Rader, it also suggests another person who did at least inhabit California for a time during the Zodiac era, namely Robert Alan Durst. Somehow I suspect that both will turn out to be total coincidences. We cannot know for certain what the Zodiac really "meant" by all of his quasi-religious ramblings, if anything. The big problem with pinning the tag on Rader is proof. Someone would need to find proof in the records that he returned to California at the exact times when the Zodiac was doing his "thing". But ultimately, even that may not be proof enough. It does seem very unlikely to me that a soldier on assignment during a period of war would be granted several leaves of absence to California. And to just drive off to wherever he wanted to on his return trips, umm, wouldn't he have been missed? The only way I can get my head around this is if he was some kind of dispatcher in a special or privileged position, or he had to return to oversee the safe supply of certain valuable stores. These could have been electronic in nature. If this was the case, I imagine there would have been a lot of secrecy surrounding this position. Finding records after all this time may prove impossible. And without the support of DNA, any matches in his whereabouts may be simply dismissed as "coincidental". After all, there are other suspects who at least lived in San Francisco or nearby during that entire period. His really big "planned event" i.e. bus bomb, evaporated into thin air. In a manner similar to Kim Jong Un threatening total nuclear holocaust, it came in a bluster but went out in a puff of whimsical melodrama. Very true, the bomb ( death machine) was interesting. Why he explained how the rain took it out is captivating I think of that comment in depth at times. As if he’s a scientist explaining to a class what happened ... weird. The Zodiac was well read and educated we know that, how the Mikado found its way into scene is interesting as well, here and gone. As for picking the kiddies off as they exit the bus?.. again another example of how his mind was crazy. Anything to grab the public’s attention and direct it on himself. .. Heres a thought, was he trying to grab his fathers or mothers attention in a anonymous way??? Was he the ignored son? Some people have already commented that the "rainy day disconnect" sounds like a song lyric. Perhaps just another example of the Zodiac dabbling in poetry while planning carnage? I've never been very impressed by that crazy bus bomb diagram, to be honest. Looks really amateurish, like something a child would draw. I have another thought to share and I would like everyone’s opinion on this. What are the odds that a family member knew who is the zodiac wise I have another thought to share and I would like everyone’s opinion on this. What are the odds that a family member knew who the Zodiac was? For instance authorities were looking for a white male 5’ 10” barrel chested, who possibly served in the Navy, possibly served in communications where ciphers are used. You know if he had any family members that were alive they would’ve been reading the same things the general public was and you would think they would put the two together similar to the Ted Kaczynski case. I think his parents would have known and they kept their mouths shut due to family discrace. Especially his father, if he was a businessman or involved in rotary or the Elks Lodge something of that nature. Hmmm. Lots of people already have. The problem, some might say, is that too many people have! Interesting fellow! And not his true identity. The real Joseph Newton Chandler died aged 8 years old. Was he the Zodiac? Who would know? Nobody. Lots of speculation of course, simply because he looks a bit like that one sketch.